Originally built as a private family retreat near the historic Caribbean enclave of Portobelo, today El Otro Lado welcomes guests to “the other side” of Panama, a world away from the bustle of city life, where time moves at a slower pace and invites visitors to linger, explore and relax. From the thick fortress walls that once protected Spanish galleons from marauding pirates to the vibrant art and pulsating drum music of the Congos, the area vibrates with a rich history and culture. Bordered by rainforest and ancient forts, the waterfront hideaway is a work of art in and of itself. Architecture and design reflect the colors, magic and whimsy of the Congo culture and rooms are adorned with original artwork and striking portraits by renowned Panamanian photographer Sandra Eleta (cousin of El Otro Lado’s owner.) The retreat now operates as a nonprofit extension of the Bahia Portobelo Foundation and offers guests the opportunity to immerse themselves in the surrounding nature, culture, history and flavors unique to this part of Panama’s Caribbean coast. New in 2019, the El Otro Lado experience includes guided hikes through the rainforest, story-telling walks to UNESCO fortifications, boat trips to nearby beaches and reefs, wellness activities and dance performances or drumming lessons with the community troupe to help guests connect with the essence of Portobelo. El Otro Lado is about 90 minutes from Panama City, which features both the domestic Albrook Airport (PAC) and Tocumen International (PTY) airports. Air Panama flies via Albrook and Copa Airlines flies via Tocumen. Tocumen International Airport (PTY) in Panama City is 90 minutes from El Otro Lado by car. Guests can choose to reach “the other side” of Panama by car (all paved highway driving), the train along the Panama Canal, helicopter, or, with the assistance of a DMC, via a private Panama Canal transit that concludes in Colon. We recommend that guests take at least a half day and explore with a guide on their way to El Otro Lado from Panama City. The Canal Locks, kayaking on Gatun Lake, e-bike trips to spot rainforest wildlife and visits with the Embera indigenous community are all possibilities. The Dry Season brings four months of glorious sunshine and very little rain - between 0-5 days per month on average - and many of the colorful Congo festivals occur during this time.. During the Green Season, days will often be sunny or partly cloudy, with an afternoon or evening “warm” storm that typically lasts a few hours. In the Rainy Season you will have some downpours but this time of year brings lots of celebrations to Panama and Portobelo. The Festival of the Black Christ on October 21 draws tens of thousands of pilgrims and spectators to Portobelo and the Church of San Felipe every year. Through the Bahía Portobelo Foundation, young guests of El Otro Lado can meet local students at La Escuelita del Ritmo (The Little Rhythm School) and participate in drumming circles or music and dance workshops that promote the local culture and art through music education. Families can also visit the onsite wood shop and artist’s studio at the Casa de la Cultura Congo where they are invited to learn about the inspiration and techniques behind the Congo style from local artisans and then create their own pieces to take home. Onsite, Ricardo “Batman” Conte, El Otro Lado’s Experience Director, uses his sense of adventure and enthusiasm to create endless opportunities for children and teens to learn, explore, discover, and play. A former coach at Panama City’s Nitro Circus (an adventure sports resort that specialized in kite boarding, surfing and more) Ricardo is the perfect person to lead kids on rainforest hikes, treks to the top of ancient forts and explorations of the coasts, mangroves and nearby beaches via kayak, SUP, motor boat and snorkel. Accommodations also cater to families. Right along the water, the Spirit House is perfect for a family of four or five with two separate bedrooms and the option for a third bed in the living room. Larger groups will likely prefer the three bedroom Casa Grande, which features two loft suites. Recommended for full buyout, the Casa Grande can accommodate a private group of 6 adults and 4 children or teenagers. The minimum suggested is three nights. Four nights is ideal which will allow guests to participate in all of the included experiences in the Portobelo community, surrounding rainforest and nearby beaches, but still provide for some down time at the property. El Otro Lado also works with an excellent local catamaran operator & guide; guests with a keen interest in diving, snorkeling or exploring the real history behind the “Pirates of the Caribbean” will want to charter the catamaran for a full day at sea. El Otro Lado is a passion project spanning three generations of the Eleta Family, well known in Panama for their long patronage of Panamanian arts & culture and for the renowned photography of Sandra Eleta. Read more about Sandra Eleta’s work and the family connection to Portobelo in this piece from the Guggenheim. Simple logistics make this an easy sell to get travelers to discover Panama beyond the City and Canal, and the unique vibrancy of Portobelo and El Otro Lado is often an unexpected highlight of a trip to the country. The Afro-Caribbean Congo Culture - which was just recognized by UNESCO as an essential part of the “Cultural Heritage of Humanity” - is richly celebrated at the hotel and through drumming and dance performances in Portobelo. Guests traveling during Carnaval and after Easter have the opportunity to attend two unique festivals, Pollera Conga and the Festival of the Congos and Devils. Through elaborate costumes, music and dance performances, these festivals re-tell the history of the Congos, their arrival from Africa as slaves and how they rebelled against the Spanish and won their freedom. Lovers of interior design will be in heaven here; architectural details at the hotel pay homage to historical buildings in Portobelo and the colors reflect the bright hues favored by Congo artisans. Each casita and room houses a treasure of original photography, artwork and unique furniture collected from the owner’s personal travels to Africa. New for 2019, all-inclusive rates (excluding alcohol) offer more opportunities for guests to discover the history, culture and nature of Portobelo through both small group and private experiences, offering greater value. Wellness experiences - focusing on yoga classes and meditation - are also offered several times each week on a complimentary basis. El Otro Lado now operates as part of the nonprofit Bahia Portobelo Foundation, which focuses on providing employment for the local community and promoting local arts and culture through artistic expression. Combining a three night stay at El Otro Lado with two days in Panama City makes a perfect quick getaway to Panama and an easy stopover to break up a longer trip further south to Chile or Argentina. Travelers with more time can combine El Otro Lado with the untouched beaches of Isla Palenque and rich marine life in the Gulf of Chiriquí, and the cloud forests surrounding Boquete in the Chiriquí Highlands, home to the resplendent quetzal and the world's most expensive variety of shade-grown coffee. Casa Grande at El Otro Lado is a 3 bedroom private home that sits at the highest point of the property. With over 8,000 sq. ft of indoor and outdoor living space, the house is ideal for private rental by groups of up to 10 (6 adults and 4 children or teens.) The architecture reflects the historical Custom’s House in Portobelo with large ironwood beams and expansive wraparound porches. Downstairs features a large open air kitchen where guests can watch the chef prepare meals while seated at the bar. Meals are often served outside on the patio and small group cooking classes can be hosted in the kitchen. Half of the lower floor of Casa Grande is enclosed as an expansive & air conditioned living, sitting and dining room. 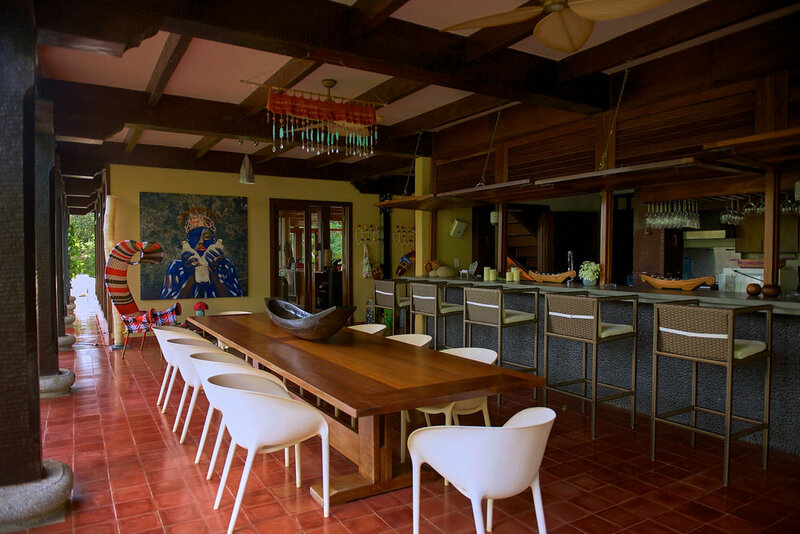 As Casa Grande was the private home of El Otro Lado’s owner, Aurora Eleta, the room contains many family photos, artwork from her private collection and many photographs shot by her cousin, renowned Panamanian photographer Sandra Eleta. On the upper floor, accessed via a colorful staircase, three spacious en suite bedrooms all open up to a large covered balcony with plenty of hammocks and lounge chairs. Suite 2 in Casa Grande features local Congo artwork and a hand carved bed frame. The upstairs loft in Suite 2 features two twin beds and is ideal for children or teenagers. Suite 3 at Casa Grande features two double beds on the bottom level and an attic loft with two twin beds. The headboards are carved and painted by the Guna Yala people of the San Blas Islands. New in 2019 and on request, the two double beds on the ground floor can be replaced by one king. Suite 3 at Casa Grande is ideal for two children or teenagers. Suite 4 at Casa Grande features two full beds (or on request 1 king bed) and colorful details that reflect the region’s Afro-Caribbean culture. A one-bedroom villa tucked between a soothing waterfall and the rainforest, Forest House features the work of local artists, together with molas (decorative fabrics painted by Guna Yala Indians) and a collection of Turkish caps. At 700 sq ft, Forest House has a king bed, ensuite bathroom with spacious shower, living room with a writing desk and a private patio and terrace. Sea House is a one-bedroom villa on the edge of the forest and overlooking the pool. It’s approximately 700 sq ft and also has a king bed, ensuite bathroom with spacious shower, living room with a writing desk and a private patio and terrace. Largest of the one-bedroom villas, Sun House sits on the edge of the property, overlooking the water from its two terraces. Sun House is over 1,000 sq. ft, features a king bed, a living room and a small kitchenette and can accommodate an additional child or teenager with an added bed for a total of 3 people. It is decorated with a collection of Congo headgear and invites guests to relax with an indoor hammock and many private outdoor spaces. Largest of the one-bedroom villas, Sun House sits on the edge of the property, overlooking the water from its two terraces. Sun House is over 1,000 sq. ft, features a king bed, a living room and a small kitchenette and can accommodate an additional child or teenager with an added bed. It is decorated with a collection of Congo headgear and invites guests to relax with an indoor hammock and many private outdoor spaces. 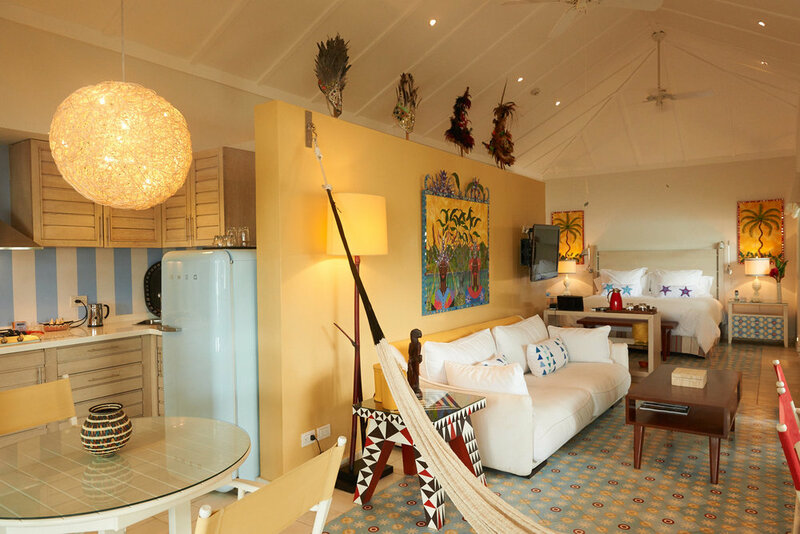 Spirit House is a two-bedroom Villa located right at the water’s edge that is ideal for families or two couples. Each bedroom has a private en suite bathroom and can be configured with either a king bed or two double beds on request. The Spirit House is over 2,000 sq ft and has a private terrace overlooking the water. The two bedrooms are connected via a spacious living room which also contains a small kitchen.